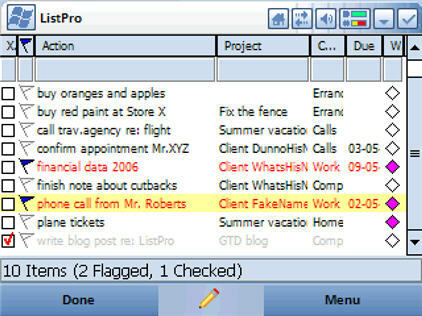 Update Aug 07, 2007: I have created a new version of my ListPro GTD System. It includes lists for: Next Actions, Projects, Someday/Maybes, Tickler File, Reference System Index, Overview of GTD Workflow and Weekly Review Checklist. You can now purchase this Pro Version straight from my webshop. The free version (only Next Actions and Someday/Maybe list) is now available for download right here. Ever since my employer provided me with a PDA (iPAQ hx2490b) I have been looking for the right software to make it useful as a mobile tool for Getting Things Done. Frequent readers of this blog know that I am not particularly fond of online GTD applications. They also know that my current GTD setup consists of Excel in combination with a PocketMod. As a kind of experiment to make my GTD system ever more simple (while maintaining flexibility and portability) I have used Ilium Software ListPro for the last couple of weeks as a single tool for implementing GTD. Read on to find out how I am trying to get back to the basics of Getting Things Done… GTD is all lists after all! First of all, I probably could have used any other task list program for Windows Mobile out there. I didn’t. I stuck with ListPro because so far it does what I need. There is no affiliation between Ilium Software and me. ListPro installs to your (Windows) desktop computer as well as to your Windows Mobile PDA. I am not going to talk much about the desktop version; it basically provides the same functionality as the PDA version. For reference, let me give you a quick overview of my current GTD system. It consists of a custom made Excel sheet with an overview page (dashboard if you will), a next actions list, a project list and a someday/maybe list. This Excel sheet provides the flexibility I require of my GTD system (sort, filter, print, et cetera). 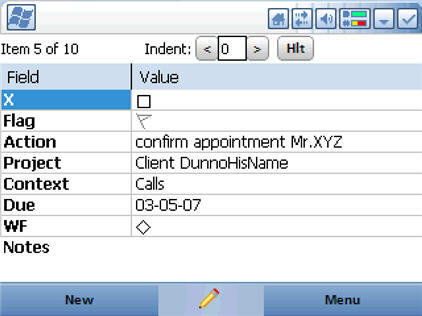 Portability is provided simply by printing the Excel sheet onto a PocketMod. Next actions can easily be marked complete, marked with a specific color (highlight), deleted, moved, copied and so on. Ignore the Flag field and highlight colors if you really require a straightforward GTD next action list. Flagged items can be hidden or shown. The same goes for completed items. Of course, flagged items can be used in any way you like; it all depends on the semantics you assign to it. Additionally, items may be edited inline. Note the Project and Context field in the screenshot above. These are actually pull-down lists because Projects and Contexts are defined as categories in ListPro. You can add or delete any item to any category you want. My someday/maybe list is contained in another, separate ListPro list. I’m not showing it here because it is really nothing more than a simple list with only one column. I don’t use all the features of ListPro. For instance, I have no use for hierarchical tasks. 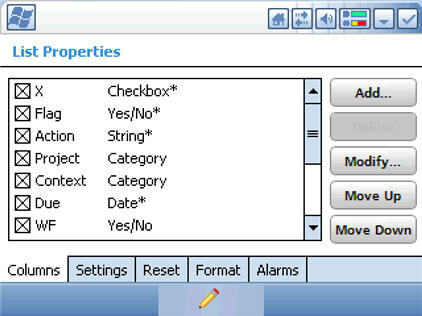 ListPro has a very convenient import and export feature. Migrating my next actions from Excel to ListPro was done in a couple of seconds. Printing a list of next actions is sometimes convenient if you do not want to take your PDA with you. Even though I would have liked to see a little bit more flexibility regarding print options in the desktop version of ListPro, I am still satisfied with the resulting list on paper. So far I am pretty pleased with ListPro on my PDA. I haven’t used my Excel/PocketMod for GTD in a couple of weeks. Of course I can always go back to my old system very quickly if I want to. For now I think I will stick to ListPro a little bit longer! What a great write-up. I’ve just d/l’d your template from the listpro website and will give this a try. I hope you can put my GTD template to good use! at our blog site and later in the magazine at http://www.pocketpcmag.com/_archives/Feb07/pocketview.aspx. One of our bloggers, Bruce Keener has written other GTD articles. I’ve read your blog and articles before. I also use software like Pocket Informant and MindManager. However, I’m careful not to make them central to my GTD implementation. I am trying to stay with the basic list structure with as less detail as possible to keep things simple. That’s why I started using (and I am still using) ListPro. For other activities like planning or note-taking I am using mindmaps and/or other paper-based tools. The reason why I didn’t use Listpro (a GREAT program and company BTW) was because I am so email-centric. That is, the vast majority of stuff that comes my way to deal with, or that I initiate, comes through email. 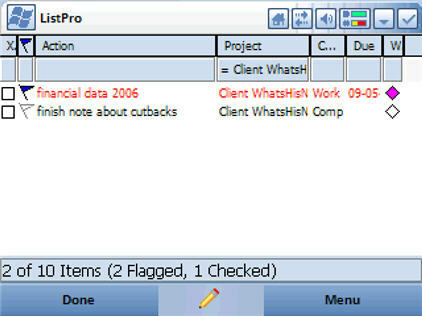 That is why I adopted the Netcentrics GTD Outllook add-in/Pocket Informant solution. 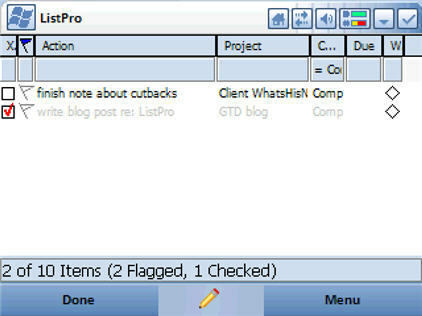 I also use ListPro for my GTD system. As far as this template goes, there are some good suggestions I can incorporate, like adding Project and Due Date fields to my NA list. However, it doesn’t look completely functional to me. Don’t you need to have a separate Projects list, where you can actually brainstorm all NA in the notes? Also, adding waiting for to your NA seems like cluttering to me. 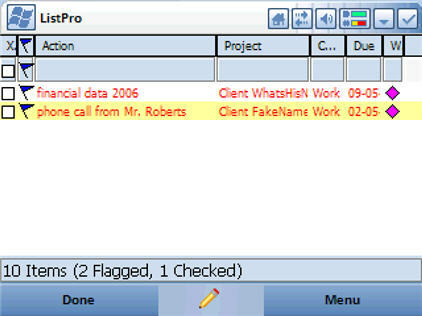 I have a separate ListPro list for waiting for that has fields like “what”, “who from”, “last contact date”. Then you can go and see your entire waiting for list without it overwhelming your NA’s. And the “important/not important” flag is a bit dubious. If things weren’t important why would they be on the list? Plus, you’d tend to constantly leave “unimportant things” behind. Also helpful to have a Monthly Tickler folder in ListPro with a list for each month. At the beginning of each month ideas/NA’s from that monthly tickler can be put into appropriate projects/NA’s. Great comments! My ListPro template has evolved a little since I wrote this post. 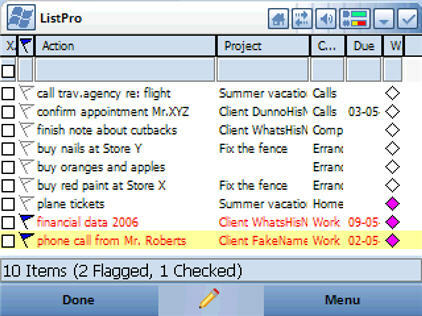 I also create many other lists in ListPro that are directly or indirectly connected to GTD. However, this post still shows the core of my GTD system which is one master NA list. * (separate) project list: this is something I’m not quite happy with myself in the current ListPro template. However, I have a physical and/or digital folder for almost every project I have in my GTD system. These contain items like successful outcome, (future) next actions, brainstorm output, etc. * “waiting for” items cluttering the NA list: I frequently need to switch the status of next actions from “waiting for” to “normal” and vice versa. To me it made sense to create one master list including the “waiting for” items, since I’m always sorting and filtering the list anyway (which is quite easy and intuitive in ListPro). The list never feels cluttered unless I remove all filters. * important / not important flag: this is indeed a bit dubious and not truly GTD. I try not to use this flag at all because GTD uses different criteria for selecting a next action. However, sometimes I use the flag to mark next actions that I want/need finished today. You can choose to remove it completely from the template or assign your own meaning to the flag. * tickler file: I have a separate physical tickler file; I don’t have a digital one. i really fancy your application of GTD with Listpro, please be kind enough to send me your template. I’ve just sent you an e-mail with the template! I’ve been using ListPro a couple of months and now I want to use it for my GTD. Please could you send me your template. Absolutely great and elegant template! There are some questions … First, why there is no tickler there – intentionally? Yep, see also comment @Helen above. Thanks, another question – are there any another ListPro lists you could suggest to use as an accompaniement to the main GTD template? I have no particular suggestions other than to create your own lists. I am using the main GTD template as the core of my GTD setup and I have created a lot of other simple lists for enumerating items. It would also be very easy to create a tickler file this way. I think there is anothere GTD template at the official Ilium ListPro website, maybe you can check it out. Good luck! Really interested in your GTD template for listpro. I’m in China and not convenient for me to pay on-line. Can I get the template for trial? Big thx. Can I just download this software to my mac and then connect that to a pda to install it that way, so I don’t have to put the pda online? 1. You should really check with the creator of the ListPro software, which is IliumSoft. My guess is that the software will work on almost every Pocket PC or Windows Mobile device. 2. I can’t answer that question for you. I use ActiveSync on Windows to install software to my Windows Mobile PDA. I would search the internet a bit more if I were you. Good luck! I will also give your method a try, can you please also send me your template? I am on win mobile 6 with Htc from work. Would like to use your method on that. the great (supposatly) app ‘Things’. Any experience with that app? Please see the links at the very top of this page. Unfortunately I have no experience with the iPhone or Things. I would be interested to hear what you think about my ListPro GTD template.